Having the winter blues? Daydreaming of warm sailing breezes out on the bay with your special someone? Wondering what romantic gift to give your honey on Valentines' Day? We'd like to help make the dream reality by offering a winter special on sailing tickets purchased in advance for our upcoming sailing season. Purchase sailing tickets for either the Schooner Olad or the Cutter Owl online and receive $5 off each ticket purchased by using code 19Winter5 during checkout. Offer is good from now till February 17, 2019. Thinking of booking a private sailing charter on the Schooner Olad or Cutter Owl for a special event, lobster bake, or wedding? We are offering specials for booking private sails in advance as well. Please give us a call or email us for more details. Enjoy your winter...spring and sailing are just around the corner! When looking for the perfect gift for the sailing enthusiast in your life, search no further! We have the perfect gift for them. Give the gift of a two hour sail on one of our beautiful wooden vessels this holiday season. Your loved ones will be so happy you did. We are available for the purchase of Olad and Owl gift certificates for sailing by calling 207-236-2323, or our online store at www.maineschooners.com. Our gift certificates never expire, and are good for up to 2 hours of sailing throughout our season. We also have a great selection of t-shirts, hats, sail maker bags, and other sailing oriented gifts available on our online store for purchase. Orders typically ship next day, so you'll have your items well in hand before Christmas. We hope you enjoy a great holiday season with your family and loved ones! Camden Windjammer Festival Weekend is almost here! We're gearing up for what is sure to be a great weekend! 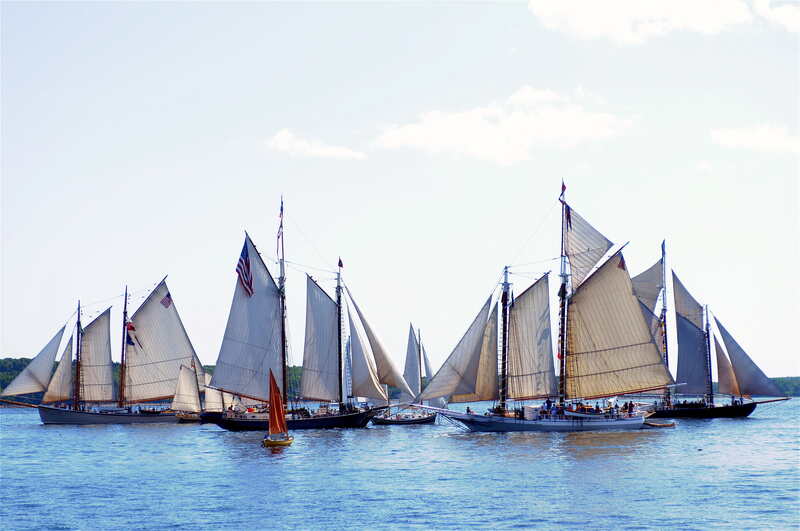 The Camden Windjammer Weekend begins this Friday with tons of activities in the harbor and lots of sailing to view the windjammer fleet of Penobscot Bay make it's way into Camden Harbor. 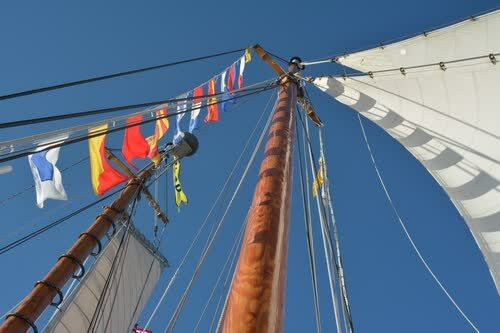 We have sails available on both the Olad and Owl for your viewing pleasure. Saturday brings the ever popular Parade of Sail. Join us on our 2:30pm sail on the Olad and 3:45pm sail aboard the Owl to be a part of the festivities. Space still available. We hope you'll be able to join us in Camden for all the fun! June is a great month to sail aboard the Schooner Olad and the Cutter Owl! We will start offering our sunset sails aboard the Olad starting June 10th, which also happens to be the same day the Cutter Owl will begin it's regular full time sailing schedule. 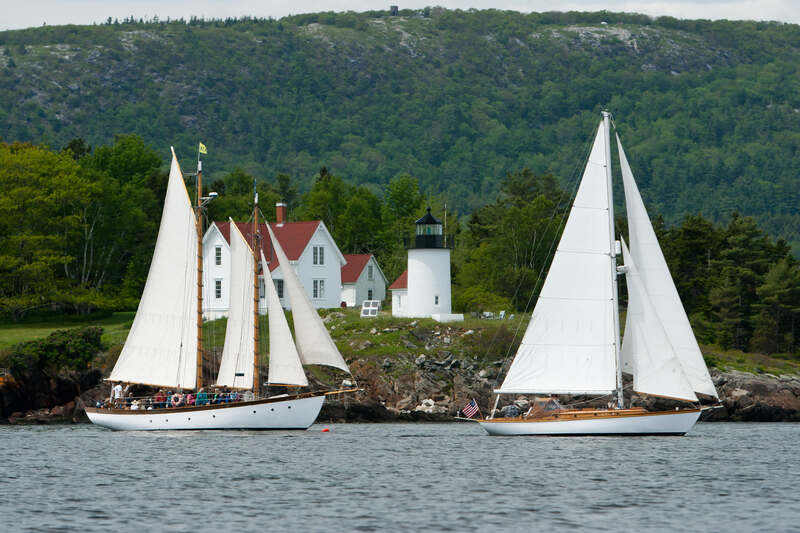 Enjoy a great sail in Penobscot Bay whether aboard the Olad or Owl. June 17th is Father's Day Show dad he's doing a great job by taking him for a sail aboard the Schooner Olad. Dad will receive 1/2 off his ticket when accompanied by a family member. Call us at 207-236-2323 for reservations. To round off a great month of sailing, celebrate the Summer Solstice by taking a Sunrise Sail with us on June 21st aboard the Olad. We'll be leaving the dock at 4:15am to head out into the bay to watch the sunrise on the longest day of the year. We know how early that sounds, so we'll have baked goods and coffee on board to help ease the early hour. We hope to see you out sailing with us! Our sailing season has officially begun! To celebrate this upcoming holiday weekend, we are offering $5 off a ticket when purchased online using the code 18Ticket5 at checkout today through May 28th. Buy your tickets for this weekend, or for a future sail with us this summer on either the Schooner Olad or the Cutter Owl and save. The Cutter Owl will start it's sailing season this weekend as well! Experience a sail on the smaller of our two sailing vessels, and you won't be disapointed. Accommodating up to 6 passengers, it's a great boat for small groups who would like a sailing trip all to themselves. We hope you're able to come sailing with us this weekend, but whatever you do, enjoy! Our Season Begins on May 10th! We are super excited to start our sailing season this week! The Schooner Olad will be running public sails, weather permitting, starting this Thursday the 10th at 12:30pm. Saturday and Sunday look especially good for taking mom out for a Mother's Day sail. Come into Camden to participate in the area's Camden is Blooming event, and enjoy the many sales and specials going on all weekend. Our store will be celebrating it's opening for another season with 10% off store merchandise and sailing tickets all weekend long. Please stop by and say hi, or give us a call at 207-236-2323 to make reservations. You can also visit us on the web, www.maineschooners.com. Hurray for another season of sailing!!! Pre-sailing season specials on sailing tickets! Purchase your tickets for our 2018 sailing season online at www.maineschooners.com between now and April 30th, and receive $5 off the regular ticket price for each member of your group. Use the code 18spring5 during checkout. We hope you're able to come sailing with us! Our season is starting in mid-May, and we can't wait! We are currently hiring for our upcoming season, and are actively seeking someone reliable, social, organized, and flexible(to name a few), for a full time position in our retail shop to start the second week in May through to the middle/end of October. This person will be responsible for selling tickets to people interested in sailing aboard our boats, maintaining and selling merchandise, and helping to create an inviting atmosphere for everyone who walks through our door. Retail experience very helpful, and an interest in sailing a plus. We are also looking for a couple of people to join our team to sell tickets for us a few days a week on the dock. This part-time position will start mid-May, and run through the end of our season in October. Applicant should be outgoing, good at multi-tasking, and someone who enjoys selling. Sailing enthusiasts are a bonus!